Novak Djokovic outplayed Andy Murray to win the Australian Open for the second time and end the Briton's hopes of a first Grand Slam title. The 23-year-old Serbian won 6-4 6-2 6-3 in a stiflingly hot Melbourne to regain the title he first won in 2008 and condemn Murray to a third defeat in Grand Slam finals. 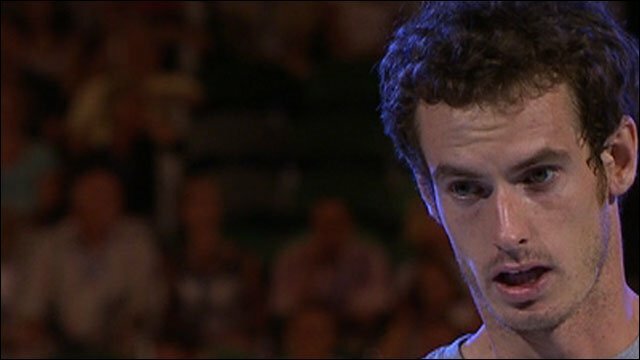 Murray had been hoping to become the first British man to claim a major title since Fred Perry won the US Open in 1936, and Scotland's first ever Grand Slam singles champion, but he was overpowered by the world number three. "He had an unbelievable tournament and deserved to win," said Murray afterwards. "Hopefully I'll come back and have more chances in the future." A victorious Djokovic responded: "I want to congratulate Andy for a great two weeks, it was really difficult to play against you tonight. 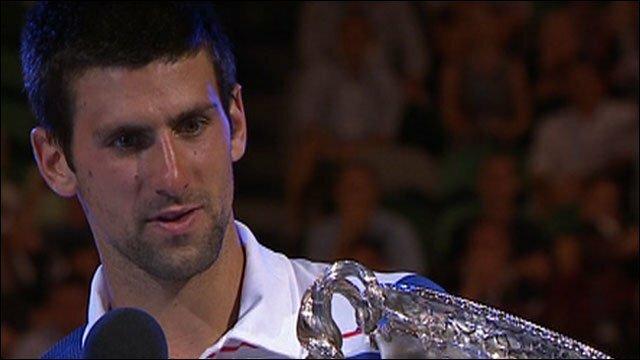 Hopefully you will have another chance to win a Grand Slam trophy and, with your talent, I'm sure you will." Djokovic went into Sunday's final a slight favourite having beaten reigning champion Roger Federer in straight sets in the semi-finals, and with the confidence of having won the Australian title in 2008. Murray, seeded fifth, has always claimed not to be affected by his nation's clamour for a Grand Slam champion, but his own desire to land a major title after twice losing in finals brings enough pressure and he made a nervous start. Djokovic hammered some heavy forehands in the Briton's opening service game and earned a break point, but a loose error let Murray off the hook and the Scot edged through a tense 15-minute game. Murray then immediately had a half-chance of his own on the Djokovic serve, only to miss a smash at 15-30, but the rhythm was set and both men knew they were in for a battle. The decisive moment came with Murray serving to stay in the set at 4-5, 15-30 down and a gripping 38-stroke rally which the Briton looked like winning on several occasions, only for Djokovic's amazing powers of recovery to eventually force the error. A forehand error from Murray then gave up the first set after a gruelling 59 minutes and the more assertive style of Djokovic was holding sway, a beautiful lob helping him to a love service game at the start of the second set. With Murray making fewer than 50% of first serves, Djokovic was able to draw his man into lengthy rallies and dominate with his greater power and incredible movement. The second break point of the match was seen off by Murray with an ace but when he went for a drop shot on the third moments later, Djokovic was onto it in a flash to sweep away a backhand winner. As well as Djokovic was playing, it was Murray who was the major contributor to his falling a double-break down in game four as he netted a volley and then pushed a forehand long. But any hope that he would take some of that momentum into the third set disappeared as the relentless Djokovic broke the Murray serve for the third time to close out the set. Murray, who had now lost all eight sets he had played in Grand Slam finals, was facing the monumental task of taking the irrepressible Djokovic to five, but he took a first step on that journey by firing a forehand winner to break at the start of the third. It did not signal a significant shift in fortunes, though, as within minutes he was shouting angrily towards his mother Judy and team of coaches in his player's box after a desperately poor smash handed the advantage straight back. Djokovic was closing in now and heaped the pressure on at 2-1, refusing to give up the game after Murray valiantly saved six break points and seizing the seemingly vital break with a magnificent backhand down the line past the helpless Briton. The route to the finish line was not to be straightforward, with the apparently hopeless situation appearing to relax Murray as it had in the second set, and he fought his way back to level, saving more break points on his way to 3-3. Djokovic was not to be denied though and bludgeoned his way to a 17th break point of the day at 4-3 with some more fearsome forehands, and Murray duly netted under the pressure to leave the Serbian serving for the title. There was to be no late reprieve for the Briton as Djokovic came through an understandably edgy final game to secure his second Grand Slam title, and leave Murray still waiting for a first. "I dedicate this title to my family, my brothers, my girl Jelena back home, my people that have been with me for so many years," said Djokovic. "It has been a tough period for our people in Serbia. We are trying every single day to present our country in the best possible way, so this is for my country Serbia."